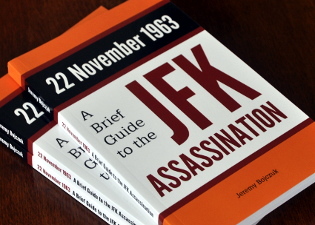 You are here: Home › Further Reading › JFK Assassination FAQs › Was the TSBD Paper Bag Genuine? Although it contained faint prints from Oswald, the bag that was found on the sixth floor was not seen by several of the earliest police witnesses, and did not appear in the earliest crime scene photographs. The only physical evidence that linked Lee Harvey Oswald to the assassination of President Kennedy was the rifle and bullet shells that were discovered on the sixth floor of the Texas School Book Depository (see The Basic Facts of the JFK Assassination). When Did Oswald Bring the Rifle to the TSBD? If Oswald had been the lone assassin, he must have brought the rifle into the TSBD himself. According to the Warren Commission’s case against Oswald, he had stored the rifle in the garage of the house in which his wife and children were staying. Oswald himself was living in a rented room several miles nearer to his place of work. The only plausible opportunity for Oswald to retrieve the rifle was when he stayed with his wife and children the night before the assassination. The Dallas police claimed to have found a paper bag on the sixth floor close to the south–eastern window from which Oswald was supposed to have fired the shots. They alleged that he had used this bag to disguise the rifle when bringing it from its storage place to the TSBD. The bag, which was entered into evidence as Commission Exhibit 142, had not been commercially manufactured, but instead had been assembled by hand from wrapping paper and tape. The eye–witness evidence strongly suggests that Oswald had not carried the bag when travelling to work that morning. The photographic and eye–witness evidence does not support the claim that the bag had been found on the sixth floor. Laboratory analysis suggests that the bag had not contained the rifle. Laboratory analyses and eye–witness evidence suggests that the bag had not been assembled by Oswald before the day of the assassination. Buell Wesley Frazier had given Oswald a lift to work on the morning of the assassination. He stated that Oswald had carried a paper bag about 27 inches (69 cm) long, a length consistent with Frazier’s description of Oswald holding one end of the package cupped in his right hand and the other tucked under his armpit ( Warren Commission Hearings , vol.24, p.409 and Warren Commission Hearings , vol.2, pp.239–43). Linnie Mae Randle, Frazier’s sister, also claimed to have seen Oswald holding a bag about 27 inches long ( Warren Commission Hearings , vol.24, p.408 and Warren Commission Hearings , vol.2, pp.248–50). Jack Dougherty, a colleague of Oswald and Frazier, claimed that Oswald had been carrying nothing when he arrived at work ( Warren Commission Hearings , vol.6, pp.376f). The sixth–floor rifle was 35 inches (88 cm) long when disassembled, and 40 inches (102 cm) long when intact ( Warren Commission Hearings , vol.3, p.395). Linnie Mae Randle saw Oswald before he began his journey to work. She described him gripping the top of the paper bag in his right hand as the bottom of the bag “almost touched the ground” ( Warren Commission Hearings , vol.2, p.248). Buell Wesley Frazier described Oswald about half an hour later, holding the bag “cupped in his [right] hand”, with the top of the bag under his armpit ( ibid. , p.239). It would be reasonable to suppose that the weight of a rifle may have caused at least Oswald’s right fingerprints and right palm print to become attached to one or both ends of the package. Did you lift any prints? There wasn’t but just smudges on it — is all it was. There was one little ole piece of a print and I’m sure I put a piece of tape on it to preserve it … just a partial print. The print of a finger or palm or what? You couldn’t tell, it was so small. and a part of a left index fingerprint ( ibid. , p.287 [Commission Exhibit 633]). Although the bag, or at least the paper that was used to make the bag, appears to have come into contact with Oswald’s hands at some point, the fingerprint and palm print evidence was insufficient to prove that Oswald had carried the bag in the manner described by Randle and Frazier, or that he had assembled the bag by hand. There is a good deal of uncertainty about whether the police had actually discovered a bag by the supposed sniper’s nest. Montgomery also saw a bag but denied picking it up ( ibid. , p.98). Was There a Paper Bag on the Sixth Floor? Gerald Hill stated that “the only sack that I saw” was one that was later shown to have contained a TSBD employee’s lunch ( ibid. , p.65; he describes his discovery of the lunch bag on p.46). Elmer Boyd also saw the lunch bag, and stated that “I don’t believe I did” see any brown wrapping paper near the window ( ibid. , p.122). Roger Craig stated that “I don’t remember seeing” a paper bag on the floor ( Warren Commission Hearings , vol.6, p.268). Luke Mooney, who appears to have been the first officer to examine the south–east corner of the sixth floor, “didn’t see anything over in the corner” ( Warren Commission Hearings , vol.3, p.286). Did you ever see a paper sack in the items that were taken from the Texas School Book Depository building? No, sir; I did not. It seems like there was some chicken bones or maybe a lunch; no, I believe that someone had gathered it up. Well, this was another type of bag made out of brown paper; did you ever see it? No, sir; I don’t believe I did. I don’t recall it. More importantly, the paper bag is not present in any of the photographs made by the police of the area around the south–east window. The Warren Commission helpfully published one such photograph, Commission Exhibit 1302, with a dotted outline to indicate the supposed location of the bag. The earliest known photograph of the bag dates from about three hours after the police had entered the building. William Allen of the Dallas Times Herald photographed Detective Montgomery on the front steps of the TSBD, holding the bag; see Richard Trask, Pictures of the Pain , Yeoman Press, 1994, p.552. There were problems with the testimony of the two detectives who were in charge of photographing the scene and dusting pertinent items for fingerprints. Robert Studebaker and Carl Day each claimed to have been the officer who discovered the bag (Commission Document 5, pp.128f). Day claimed that Roy Truly, the manager of the TSBD, had been the only other person to see the bag, a claim which Truly denied ( Warren Commission Hearings , vol.3, p.231). The testimony of the other officers quoted above implies that they reached the scene before Studebaker and Day arrived. Did the Sixth–Floor Paper Bag Contain the Rifle? According to Wesley Frazier, Oswald said that the bag he carried to work contained curtain rods. Oswald denied this, and claimed that the bag contained only a sandwich and an apple ( Warren Report , p.622). The Warren Commission claimed that the bag contained a rifle. I was also requested … to examine the bag to determine if there were any significant markings or scratches or abrasions or anything by which it could be associated with the rifle, Commission Exhibit 139, that is, could I find any markings that I could tie to that rifle. … And I couldn’t find any such markings. ( Warren Commission Hearings , vol.4, p.97). What did the package look like? Well, I will be frank with you. I would just, it is right as you get out of the grocery store, just more or less out of a package, you have seen some of these brown paper sacks you can obtain from any, most of the stores, some varieties, but it was a package just roughly about two feet long. The paper, was the color of the paper, that you would get in a grocery store, is that it, a bag in a grocery store? Right. You have seen, not a real light color but you know normally, the normal color about the same color, you have seen these kinds of heavy duty bags you know like you obtain from the grocery store, something like that, about the same color of that, paper sack you get there. Frazier stated that Oswald usually carried his lunch to work in “a little paper sack you get out of a grocery store” ( ibid. , p.220). The bag produced by the Dallas police had been assembled from wrapping paper, and sealed with tape. It was an ad hoc, home–made bag, not one from a shop. The bag was made from the Texas School Book Depository’s stock of wrapping paper, and sealed with the TSBD’s tape. The paper and the tape each contained markings from one particular tape dispensing machine in the shipping room on the first floor of the building. Because the dispensing machine, which was too sturdy to have been removed from the TSBD, moistened the tape at the same time as it applied the markings, the bag must have been assembled on the premises ( Warren Commission Hearings , vol.4, pp.90–93). The person who assembled the bag was unlikely to have been Lee Harvey Oswald. The machine was under constant supervision by Troy West, who testified that he spent his entire working day at the wrapping table, and implied that Oswald never had the opportunity to manufacture the bag ( Warren Commission Hearings , vol.6, pp.360ff). When Was the Bag Assembled? James Cadigan of the FBI laboratory testified that the paper and tape of the bag possessed “identical” physical characteristics to samples of wrapping paper and tape taken by the Dallas police on the afternoon of 22 November ( Warren Commission Hearings , vol.4, p.93). The TSBD used approximately one roll of paper every three working days ( ibid. , p.96). For each consignment of 58 rolls of paper, the company ordered a consignment of 500 rolls of tape (Commission Document 897, p.163), the equivalent of using one roll of tape roughly every three working hours. The tape on the paper bag supposedly found on the sixth floor seems to have been applied within about three working hours of the samples being taken by the Dallas police. The bag is likely to have been constructed during the period between Oswald’s arrival at the TSBD, four and a half hours before the assassination, and the bag’s first public appearance in the hands of Detective Montgomery later that afternoon. The testimony of the police officers who were first on the scene, and the absence of any photographs of the bag in situ, suggests that the bag which was entered into evidence had not been discovered in the south–eastern corner of the sixth floor of the Texas School Book Depository. The two witnesses who saw Oswald carrying a bag on the morning of the assassination claimed that the bag they saw was too small to have contained a rifle, and that it was a standard grocery store bag rather than the home–made package supposedly found on the sixth floor. The physical state of the sixth–floor package was not consistent with that of a paper bag which had contained the loose parts of a disassembled rifle. The evidence of Troy West, of the TSBD’s shipping department, suggested strongly that Oswald never had an opportunity to manufacture the bag. The bag was made from a roll of tape that was probably first used on the morning of the assassination, long after Oswald was supposed to have constructed the bag. or, less charitably but more credibly, the prints were added to the bag in order to incriminate Oswald, as seems to have happened with the palm print on the rifle. The fact that the paper and tape of the bag can be dated to the day of the assassination suggests that the bag was manufactured on the afternoon of 22 November by one or more members the Dallas police force. As with the palm print on the rifle and Commission Exhibit 399, the so–called magic bullet, there are good reasons to doubt the authenticity of the paper bag. or the rifle was brought into the building without his knowledge. Ian Griggs, ‘The Paper Bag that Never Was, part 1’, Dealey Plaza Echo , vol.1, no.1, July 1996, pp.30–36. Ian Griggs, ‘The Paper Bag that Never Was, part 2’, Dealey Plaza Echo , vol.1, no.2, November 1996, pp.30–38. Silvia Meagher, Accessories After the Fact: the Warren Commission, the Authorities, and the Report , Vintage, 1992, pp.45–64. Did Oswald Carry a Bag of Curtain Rods to Work? Are There Factual Errors in Oliver Stone’s JFK ?